Since wild snow leopards are very rarely seen, it is almost impossible to count them directly. Luckily for biologists, however, they leave ample evidence – indicating their presence – in the form of pugmarks, scrapes, feces, and scent-sprays as they travel about their home ranges. 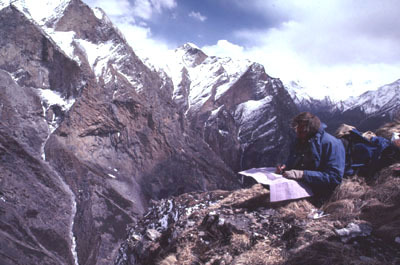 George Schaller, Rodney Jackson, Gary Ahlborn and others showed that snow leopards exhibited a special predilection for traveling along well-defined ridgelines, along the base of cliffs, in narrow valleys or drainages, or across high passes and cols connecting different watersheds. Snow Leopard SignScrapes: Snow leopards create distinctive scrapes by scuffing the ground with their hind paws. The result is a heart-shaped scrape depression with a pile of earth at one end (see photo above).Feces or scats: Feces are deposited alone or in association with other sign.Urine: Snow leopards urinate on the top of their scrapes.Scent–spraying: Both sexes scent–mark upright, typically overhanging rock faces by spraying them with urine, or rubbing their cheeks on the rock’s surface.Claw–raking: Snow leopards occasionally make claw scratches on tree trunks or rock faces.Tracks: Also known as pugmarks or spoor, snow leopards may leave an imprint of their paws in snow or on soft ground, but these are typically short–lived. The first step in undertaking a SLIMS survey is to consult the literature or contact experts to determine which areas are known or suspected to harbor snow leopard. Next is to run a sign transect in the field after identifying suitable survey areas. Transects involve walking along suspected snow leopard travel routes and counting the type and number of sign seen. (for a discussion of transects in greater detail, see “Snow Leopard Sign and Marking Patterns”.) Transects may vary in length from a few hundred yards to a mile or more. Local people should also be interviewed to determine where snow leopards have been seen and how often. Information should be gathered on the main threats to the species (such as poaching, depletion of the prey base, and retributive killing by herders as a result of heavy livestock depredation). The best times to conduct sign transect surveys are in late spring or early summer, and again in the fall, before the onset of the winter’s snowfall.